THE conception of life held by the spiritual alchemist is quite different from that ordinarily held by the man of affairs. The events that spring into existence as the result of his contact with external environment are viewed from an entirely different angle. Instead of being considered in reference to their value as factors contributing to physical survival and physical gratification, they are scanned from the height of their cosmic relations. Their worth is estimated by the measure in which they further the development of the soul and are of assistance in cosmic welfare. Through illustration let us draw this line of demarcation clearly: From the material point of view, for instance, a man is considered to be unusually lucky when he inherits a fortune. It is common to speak of a man as highly successful when he has obtained eminence in the political field. And a man who builds up a large and prosperous business is deemed one to be envied. But the spiritual alchemist jumps to no such hasty conclusions. He realizes that if we are ever to appraise anything justly we must delve deep beneath the surface of appearances. Things are often not what they seem at first glance. After all, environment and circumstances are effective only as the individual responds to them. The good and the evil reside not in events and external conditions, but in the effect they have upon the individual. The development of character is more important than physical gratification. Therefore, before saying of any event that it is fortunate or unfortunate the spiritual alchemist first looks to the more important factor, which is its effect upon the character, its contribution to the growth of the soul. A material fortune may be used as an aid to soul progress, but observation inclines to the belief that more often than not it is a spiritual hindrance, therefore alchemically a misfortune. A high political station sometimes engenders bigotry, pride and arrogance, and is then alchemically a failure. And so prosperous a business as to keep the attention absorbed by worldly affairs to the exclusion of intellectual and spiritual interests, reveals to the alchemist a condition that excites pity rather than envy. Not, it should be clearly understood, that the spiritual alchemist believes wealth, business, political station, or other worldly affairs evil. To him events, worldly affairs, or other interests are neither good nor evil, fortunate nor unfortunate, in themselves. They become good or evil only through their influence on soul culture. But quite often the things mentioned become unfortunate in individual cases because they are permitted to impair the development of the soul and hamper its progress. The spiritual alchemist conceives the universe to be an immense organic structure, or cosmic man. He perceives that individual souls are evolving from lower to higher states, and entering into rapport with the whole cosmic scheme. He apprehends that a like process is going on in it, and that the universe also is evolving and eternally unfolding its infinite possibilities of expression. In tune with the pulsating heart of nature, an inner conviction floods his consciousness that every immortal soul plays a part and has its function in this glorious scheme of creation. It is a living conscious cell within the body of Infinite Man. Expanding its consciousness, as for the moment he has done, it may even partake of the greater consciousness of the all. Thus the ineffable plan unfolds before him. Each immortal soul perpetually expands the domain of its consciousness and continually increases the power of its control over environment. The separate evolving units thread together to give more complex expression to universal consciousness and power. As a man becomes stronger when the separate cells of his body gain in vigor, so the expansion in power and more complete cooperation of souls, lend increase of consciousness and power to the Cosmic Man. Man on earth needs the separate cells of his body and the separate thoughts of his mind. Each has a real and important function to play in his economy. If any are missing, or if they are present but attempt to do the work of others, or fail to do the work assigned to them, the man, as well as the cells, suffers. Grasping, by his peculiar rapport with the inner planes of life, the relation of parts to the whole in the universal scheme, the spiritual alchemist perceives that likewise every immortal soul has its place and somewhat important function. Universal intelligence depends for expression on the sum of separate intelligences, even as man depends for mental expression on his separate thoughts. Not only does man need God, but stupendous thought though it be, there is need of God for man. Now within the physical body of man, due to his life processes, there are secretions that to avoid disease must be eliminated. Within the domain of his mentality are thoughts that must be expunged to avoid intellectual decay and moral dissolution. We may be sure, therefore, that like conditions exist in the cosmic man. But most of the physical subjects and physical entities embraced within man’s empire work for the welfare of their liege and lord and obey his commands. These harmonious, constructive atoms of physical and psychical life within man’s constitution are the bulwark of his strength; and realizing this he cherishes, supports and encourages them, happy to have them make their homes permanently with him. Thus also, the spiritual alchemist believes, the Universal Creator cherishes, supports and encourages those who assist His work, and takes pains that they shall not perish and that no real harms shall come to them. Other entities within the scope of man’s dominion there are that on almost every occasion stir up dissension and strife. These disobedient, disloyal and disintegrative subjects he finds it necessary to discipline; or if they become too arrogant, and thus threaten the whole estate, they must be deported or completely destroyed. The surgeon’s knife may be the only recourse to save the life. And in the wider realm of cosmic affairs, the spiritual alchemist perceives rebellious souls, which like Lucifer would usurp the supreme authority to themselves and make selfish gratification the highest law. These, he feels sure, are not permitted to endure in their wayward course. Their continued existence depends upon a change of attitude. Only those persist that have some value as constructive workers in carrying out the Divine Plan. This peculiar, pervading, insistent consciousness attained through spiritual alchemy reveals, in a manner not to be denied by anyone having the experience, that the Universal Mind has formulated a plan for, and commenced the erection of, the Universal Structure. It informs him in terms of deep conviction that to oppose the advancement of this cosmic plan is to throw himself athwart the tides of universal life with the surety that if the course is not altered they will carry the soul into the realms of extinction. Yet it assures him also of a tremendous immortal career if he becomes a constructive part of the eternal plan. Uniting with Deity, he partakes through association with deific work of the perpetually expanding life and consciousness of the infinite. Thus it is that the spiritual alchemist painstakingly scans the universe in the effort to discern the ineffable plan. He carefully studies himself, and assays all his qualities and opportunities, to the end that he may find just where in the cosmic work he can be of greatest service. To be of the greatest possible service in furthering God’s Evolutionary Plan becomes the absorbing aim of his life. Thus it is that he walks among men, seeming not different greatly from others, yet taking in regard to most things a diametrically opposite view. For while ordinary men reflect upon every act, motive and event in terms of their being advantageous or inimical to material success, he regards all these things from a cosmic standpoint, as constructive or destructive factors in universal life. Instead of seeking life eternal from the desire merely to persist in consciousness, he aspires to immortality because he realizes that he may become a valuable workman in the manifestation of the infinite plan. He is a willing laborer under the direction of the Universal Mind and his loss would be keenly felt by the progressive legions. He struggles spiritually to endure, not for himself alone, but to add his energy and strength to those cohorts that favor immortality for mankind and that strive to uphold law and order throughout the universe. Believing that the progress of Deity depends upon the progress of the various souls and entities embraced in the structure of the Universal Man, he considers his own intellectual and spiritual development the training to become a workman of greater skill and value. It is his duty to advance toward perfection, his duty to God above, to innumerable degrees of life below, and to mankind as a whole. Every act of his life is examined, not for its material effect, but for its influence as furthering his soul development and the cause of human progress. Every spiritual victory redounds not merely to his own credit, but places in his hands new powers that he may use to benefit his fellowman. Thus life itself is reduced to the spiritual first matter and its component parts evaluated by their fitness or unfitness to enter into the composition of transmuted spiritual gold. 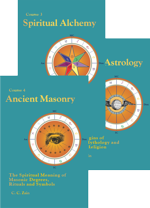 Millions of experiments carried out in various universities relative to extrasensory perception prove that the unconscious mind, or soul, is able to gain information from the past, in the present, from the minds of others, and from the future, in a manner that is contrary to physical laws. The academic scientists who have carried out innumerable experiments with extrasensory perception hold that from this faculty apparently no secret of nature nor any information in the universe can be hidden. Any knowledge desired, whatever it may be, of past, present, or future, seems to lie within the range of its acquirement. And after the dissolution of the physical, the freedom from its restrictions permit the soul more freely to use extrasensory perception. But even as on earth, where restrictions are greater, it there requires training to be able to get certain information and it requires training to understand the information contacted. Thus there is no implication that physical death gives the soul more wisdom than it had while on earth. But the indications are clear that the possibilities of gaining knowledge after life on earth is done are infinitely greater. The experiments in various universities with mechanically released dice prove the nonphysical power of the mind to move physical objects and to bring about desired physical conditions. This power, called psychokinesis, when effectively brought into play, eliminates the laborious physical processes commonly required to build something, or to bring about certain results. And the academic scientists who have been experimenting with it say that so far as is known there are no limits to what can be accomplished through this nonphysical power of the mind. This does not imply that merely because it loses its physical body the soul then can move wherever it wishes and build whatever it desires. But because the restrictions of the physical body to exercising psychokinetic power are removed, its possibilities of accomplishment after physical death are infinitely expanded. Thus do the experiments in our universities relative to extrasensory perception and psychokinesis indicate that after physical dissolution the possibilities of gaining knowledge, and the possibilities of accomplishment, are infinitely increased; and that, therefore, if the soul so desires, and will put forth the effort, it can move forward continuously to become a more effective workman in the realization of God’s Great Plan. To make gold not only must all the materials of which it is composed be present, but before the transmutation is perfected all must be there in proper proportions. If we apply the law of correspondences, it brings the conclusion that there are seven of these necessary factors. Seven colors of the solar spectrum combine to produce white light. Seven tones of the scale combine in the production of music. 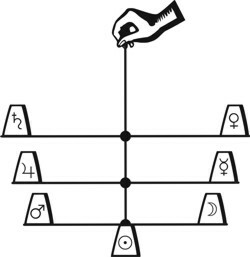 Seven planets constitute the septenary scale of astrological influences. And thus, as seven is present in those things expressing perfection of form, even in the septenary constitution of man, we may safely conclude it enters into the composition of gold. Man, the climax and point of departure of animate forms on earth, contains within himself the attributes of all life lower in the scale of being. Gold, the climax of the mineral kingdom, and its point of departure to a higher kingdom, likewise, contains within itself the qualities and attributes of all the other metals. These qualities, even as all shades of color are contained in the seven prismatic rays, are grouped in the seven typical metals that most strongly vibrate in unison each with one of the seven planets of our solar system. To enumerate: Gold itself vibrates to the Sun. Silver vibrates to the Moon. 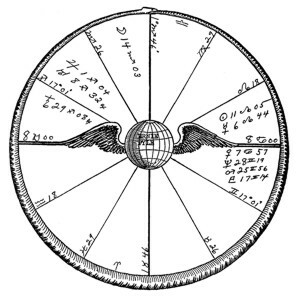 Mercury, as made reference to in alchemical works is of two kinds, the metallic Mercury and philosophical Mercury. The philosophical Mercury symbolizes the soul within, but the Mercury with which we are here concerned is somewhat more external. It vibrates to the planet Mercury. Copper vibrates to Venus. Iron vibrates to Mars. Tin vibrates Jupiter. And Lead vibrates to Saturn. Within these seven are the qualities developed by all metals, the qualities that enter into the composition of gold. Therefore, if they are combined in proper proportion, and properly acted upon alchemically, the product is transmuted gold. Following the same steps, but using the metals of spiritual alchemy, we are sure to get the same results on the spiritual plane. These metals of spiritual alchemy are the various experiences of life. All, according to type, fall into one of several natural divisions. That is, the white light of life’s combined experiences may readily be separated by the prism of astrological correspondences into seven distinct groups, or colors. 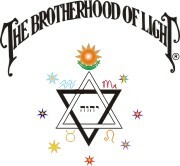 But before there can be the real white light we are considering there must be present the rays of all seven colors. Before there can be transmuted gold, there first must be brought together all seven of the essential metals. Likewise, we may be sure, before there can be spiritual gold, there must be the seven types of experience with life. These seven metals, or groups of experiences, must be collected. They cannot properly be used in just any quantity, but only in certain proportions. They must be purified and separated from their dross. To lower their fusing point they must be properly combined, or fluxed, one against another. Then, to reduce to the first matter or spiritual substance, the heat of the reverberatory furnace of their cosmic usefulness should be applied. If these steps are all followed the experiences flow together to form an organized spiritual form, complete in all its functions, an immortal body, which is the sought for spiritual gold. The first metal to be studied, because the most base of all, and therefore the most difficult to reduce to spiritual first matter and transmute, is lead. It is under the dominion of the planet Saturn. We deal, consequently, with all those motives, thoughts, feelings and experiences that are brought into the life and prompted by this most malefic of the planets. As a mineral lead is heavy, dull and morose; and the planet Saturn brings to the life heavy responsibilities, dull plodding labor and a melancholy disposition. It is a metal of extreme malleability, and in life is noted for diplomacy. It quickly tarnishes; incites, that is to petty ignoble actions; and stands as a synonym for great specific gravity, or selfishness. A major portion of the diseases, sorrows, losses, obstacles, restrictions, poverty and disappointments in the world are due to its influence. Under the most favorable conditions it brings gain; gain as the result of painful planning and plodding perseverance; intellectual supremacy through ample reflection and careful thought; and worldly station through subtlety, craftiness, cunning and unusual foresight. Without this lead in his constitution man would be destitute of caution; would act without considering the result, would buy without thought of the cost, and would make no provision for the future. He would be headstrong and rash, governed entirely by momentary impulses, and incapable of forming logical conclusions. In spiritual alchemy also it is most important; for the sorrows it brings tend to chasten the soul and may effectively be used to eliminate the dross of sensuality. Before being reduced to its first matter or purified the typical leaden viewpoint of life is made lucid in the much repeated formula that self-preservation is nature’s first law. It is the idea of self-interest; and to be sure, self-interest on any plane is essential to survival; for without desire for life and progress the soul soon succumbs to disintegrative force. But this is only a partial statement of the more complete law of life. That is, it is only mental lead, still dominated by the thought that all may sink if I may swim. The more complete law takes recognition of the interdependence of all life and the effect of mental attitudes on character. When life is viewed from the standpoint of spiritual lead the formula is that my only excuse for existence, and my only hope of survival in spiritual realms, is my value to cosmic society and the service I render to others. This means that from the alchemical standpoint selfishness always defeats its own ends; for as we strive to aggrandize self at the expense of society the power of the soul dwindles and we attain less in spirituality. But when we labor for the welfare of the whole cosmic structure with no thought of our individual interests except in so far as they are essential qualifications for efficiency in unselfish work, we really gain; for we are adding values to the only real and permanent part of ourselves; to our characters. Lead will be lead, and selfishness will be selfishness, and the only way to convince Saturn that he is wrong is to convince him that selfishness does not pay. Let him think as is commonly taught, that if he is uncharitable here he will be dealt with harshly in the after life and he will loosen the strings of his purse. Give him to understand that if he does good here on earth he will be rewarded by a soft berth in heaven, or that whatever acts he performs for or against others will be performed for or against him in a future incarnation, and he is shrewd enough to perceive the selfish advantage of doing good upon the earth. Such appeals are made directly to the lead in man. The spiritual alchemist also operates upon this mental lead, but in a different fashion. Man is selfish only through ignorance; for in his narrow mind persists the idea that it is possible for one to gain some real advantage at the expense of another. Nothing is farther from the truth; and the attempt to do so invariably results in loss greater than the apparent gain. To deprive another unjustly of money does not necessarily weaken him; for if he takes the correct mental attitude toward this loss, what he gains in fortitude may more than recompense him for his material inconvenience. This depends upon the person. But one thing is as certain as the rising and the setting of the sun. It is that such an unjust act reacts upon the character of the doer and impairs the vitality of his soul. Just as Saturn in a birth chart afflicting the luminaries impairs the physical vitality, repetition of such acts will cause chronic diseases that waste the spiritual tissues as certainly as tuberculosis destroys the body. Every selfish act of life means bartering immortal gold for sodden material lead; for material riches and advantages dishonestly gained weigh down the soul and impair its progress, even as lead carried about the person hampers physical action. To act selfishly, when viewed by the torch of knowledge, is really to act directly contrary to self-interest; for the real self- interest cannot but place a greater value upon character, which may become an immortal asset, than upon the ephemeral gain of material things that last but a matter of days. To act unselfishly, when internal relations are considered, is to act in the direction of greatest self-interest for it builds up the eternal qualities that persist when all earthly wealth has decomposed into the star dust from which it came. Thus, selfishness and unselfishness to the spiritual alchemist become synonyms for ignorance and wisdom; for each really defeats its own purpose. We cannot act selfishly without injuring self, nor can we act truly in an unselfish manner without benefiting self. Lead is lead, and to dissolve lead in the spiritual light we must place it in the reverberatory furnace of its cosmic relations. By appealing to selfishness it then becomes convinced of its folly and perceives that golden unselfishness far outweighs in value the leaden advantages of physical life. Tin is a metal of silvery-white color, malleable, ductile, and offering considerable resistance to the corrosive action of acids. It is under the dominion of the planet Jupiter, and has a low melting point. It corresponds in human life to such pure and noble moral sentiments as are of snow-white luster. True nobility of impulse itself is incorruptible, but quickly bends in malleable charity to assist a fallen brother. Its sympathies are drawn in filaments of mercy to the downtrodden and oppressed; and its dignity and reserve are melted at the sight of suffering. Tin, or Jupiter, is the major benefic, bringing to man health, wealth and affluence. This gain comes without effort, or as the result of favor inspired by good deeds. It is far removed from all that is sordid and harsh, indicating instead good cheer, genial warmth and generosity. Without tin, or Jupiter, the life of man would be stern and severe. There would be little inclination to assist others, little thought for anything save self. There would be no religion, and no charitable institutions, no paternal kindness, and no mercy. Lead demands payments with usury. Iron demands “an eye for an eye and a tooth for a tooth." But tin rises to a higher law that permits it to return good for evil. Its thought in life is to live and let live. It aspires to extend the helping hand to all mankind and lift them up through sheer nobility of purpose. We might be led to think that tin, being such a magnanimous metal, is already in a state bordering on spiritual gold, but as a matter of fact it is somewhat destructive, and also contains much dross that must be purged away in the fires of affliction. Those who pass through life without enduring the sorrows of lead, never knowing poverty and illness, ever being cared and provided for, have not the plodding steadfastness necessary for real spiritual attainment. Those who are guarded from all dangers, hedged in by protecting influences, never knowing the strife that comes from iron, have not the aggressiveness, initiative and daring courage to wrestle with the dweller on the threshold and wage a war of conquest against the angel of eternal death. Tin is proof against the acids of envy and the inroads of remorse; but cannot withstand the heat of dissipation. It is a wondrous and virtuous metal; but virtue being misapplied becomes a vice. It is a less difficult thing to give, than to know how to give wisely. To assist others to persist in idleness by unwise giving is as great an error as selfishly to withhold help from the deserving. When a hard struggle to secure bare necessities is a requisite to enable a man to find his own powers, it is a misdemeanor to furnish those necessities gratis. To encourage dissolute habits by furnishing the wherewithal to gratify them is to become a party to the fault. To give well requires as great sagacity as to acquire the wealth to give. To act with true generosity is a far more complex matter than is commonly recognized. To be really merciful is not merely to gratify the physical needs of others for food and shelter. It includes more than caring for the sick and providing material education. It necessitates a comprehension of the soul needs of the individual and the satisfying of those needs. It embraces the spiritual meaning of not to spare the rod and spoil the child. Tin must abundantly be present in the storehouse of the spiritual alchemist; but after he combines it with the other metals, before it enters into the composition of transmuted gold it must be resolved in the spiritual light to its first matter. To apply properly the heat of the reverberatory furnace he must have the spiritual discernment to foresee the result of his action upon the character of the individual before he extends his hand in help. He must know what assistance the soul needs, and render first aid to the immortal part of man, using material means to accomplish a spiritual purpose. When tin is too largely present it brings an attitude of “I am better than thou”; a feeling of righteous pride and belief that good befalls through some inherent superiority. The evils it encourages are luxurious living, love of display, and an excess of generosity. Both lead and tin are soft metals, yielding readily to pressure from the outside. Mercury ordinarily is a fluid; and copper, silver and gold, while having a hardness greater than tin and lead, are not unyielding. Iron, however, is a hard, severe metal capable of great resistance. It is harsh and gray, with a forceful character; but turns to an angry red when exposed to the attacking influence of the elements. Under the heat of affliction it gives way slowly, having a high melting point; and when so heated and suddenly cooled is distinguished for developing a temper. With the temper so aroused it is decidedly self-willed, and cannot be forced to deviate permanently from the course or form it has chosen to assume. So great is this aggressive determination that it may be brought to a state of temper where if bent from its original shape it instantly returns to it, as observed in springs, the instant the compelling pressure is removed. Iron, or Mars, is the minor malefic, furnishing man with energy, courage, resistance, aggressiveness and forcefulness. Other metals are good electric conductors; though of course, lead is too miserly to permit an electric current to flow through its domain without niggardly opposition. But iron has the distinction of itself, either permanently or temporarily, becoming magnetic. It thus exhibits an independence and force not possessed by other metals. Its great resistance and headlong impetuosity fit it preeminently to become both a tool in the hands of a worker and a weapon in the hands of a warrior. In fact, it may safely be said that all work and all conquest depend upon the amount of iron present; for if iron is lacking there will be insufficient energy for any worthwhile accomplishment. Without it any combination of other metals is weak and vacillating and altogether too pliable to serve purposes other than to be molded by such objects as they contact. Consequently, it is very important in spiritual alchemy that there be plenty of iron in the metallic fusion. Yet we cannot use iron in its common corrupted state. First the rust must be removed and cast aside. Iron in character represents the selfish and animal propensities and the destructive and constructive faculties. Without iron man would be a constant slave to fear and anxiety; he would lack the ability to struggle to attain his purpose, and be in a state of perpetual dread. It commonly manifests in life as intense desire. But as action is ever in the direction of the strongest desire, the effort should never be made to kill desires, but to divert them into channels that are individually constructive and that work for the welfare of all. No great thing was ever accomplished without enthusiasm, and where iron is not, neither is there enthusiasm. Survival depends not merely upon lead, or caution, but also upon iron; upon the ability to dare and fight and struggle and resist outside influences. Even temper is a most valuable asset, when well controlled; for it permits of an elastic rebound. A man with this kind of temper can never be kept down; for he rises as soon as he falls. He no more accepts defeat as final than does the steel spring when it is flexed. Iron is valuable alike for destruction and construction. But to be useful in spiritual alchemy it must be reduced to its first matter in spiritual substance. It must be used not merely as a weapon of physical defense, but to destroy the pernicious and licentious thoughts that menace the soul. It must be used to tear down and destroy such forms of belief and such social conditions as threaten the spiritual life of society; and tempered to a sword of finest steel it must be turned against the legions of darkness that infest the lower astral realms. Placed in the reverberatory furnace, from time to time, it must then be forged into an implement of construction. Positive, aggressive spiritual thoughts must dominate the soul, must labor to spread the light of truth, must incite to persistent effort in behalf of society, and must become true constructive instruments in the erection of the edifice of the cosmos. Copper is a metal of reddish color; soft, pliable, yielding, and a good conductor of heat and electricity. It is even a better conductor of electric force than iron, but is incapable of retaining that force and itself becoming energetic. Iron is a harsh, forceful metal, but copper is mild and gentle. It presents a pleasing comparison to lead, being bright, cheerful and happy; while lead is somber, gray, sullen, reserved and frowning. Like tin, copper exhibits most pronounced virtues when associated with other metals. It is truly the metal of union, for it is always more contented when alloyed with another. It thus entirely lacks that independence of character that distinguishes iron, and must ever have a stronger companion upon which to lean. As a component of bronze it is of great value in the arts. Copper, or Venus, is the minor benefic, furnishing man with compassion, affection, refinement, and a love of the artistic and beautiful. It lends a pleasing aspect to every metal with which it associates; in human life bringing friendship, mirthfulness, amiability and conjugality. It is especially useful in brazing, that is, strengthening the union between other metals or between their parts. Similarly it exerts itself in society to draw people into harmonious companionship. It is the metal of love, presenting, when uncorrupted, the bright and cheery aspect of good will; very unlike the hard gray tone of iron which normally is cold and cruel and when exposed to the elements becomes a dull passionate red. Copper, however, while less easily tarnished and sullied than iron, is readily affected by acids of various sorts. When so attacked it degenerates into the vile verdigris of jealousy; a slimy green corruption that soils wherever it touches. In this impure state it is a rank poison which may be used as a paint on boats to destroy barnacles, as the diseases it engenders spread in the dissolution of the barnacles of society. Or, as paris green, it is sprinkled on growing vines to kill the insects that infest them. The parasites among the human race also fall victims to its virulence. It was this noisome poison, the product of corrupted copper, that resulted in the downfall of Rome. The paris green of luxury and licentiousness ate into her vitals and poisoned her soul, and she fell through weakness, her vitality so sapped by this noxious impure copper that she was left an easy prey to outside foes. Copper, in spiritual alchemy, represents experiences with love, sympathy and affection. The world would be a harsh, bleak land without the refining influence of copper. There would be no appreciation of beauty, no knowledge of harmony; none of the softer shading of life that soothe the sting of adversity. There might be the joviality characteristic of tin, but ties of love and affection would be lacking. There might be strenuous action and fiery passion springing from iron, but no grace in those movements, and only selfishness at the base of desire. Without copper the world would be the scene of perpetual conflict, of strife without surcease; for it is the metal of peace. It is the only direct antidote for a surplus of lead; for in so far as love is present selfishness departs. Its peculiar property is that of giving strength and endurance and life to other metals, such as bronze, which is an alloy with tin, and to brass, which is an alloy with zinc. In alchemical combinations also it lends itself to permanence, and a magical ring or an amulet of metal to retain its potencies must not only contain gold and silver, but a small portion of copper. It is the love element which retains the magical force and binds the gold and silver in permanent union, permitting the interaction of magnetic forces between them. The organs of the body retain their life and perform their functions only so long as organic copper unites the separate cells that compose them and binds new cells to the old to replace those decomposed by iron; disintegrated by rust. There can be no complete and permanent union on any plane unless copper is present as the binding material. Transmuted gold is produced from a union of other metals. The importance of copper cannot be overestimated in spiritual alchemy. While impure it cannot be reduced to the first matter; for the spiritual light finds no point of contact with copper that is corrupted. But when pure it resolves, with almost no heat from the reverberatory furnace, into the spiritual state. In this condition it readily enters into union with other spiritualized metals, and never fails to add to their utility. It is very easy to mistake other elements for pure copper, and the spiritual alchemist must take unusual pains to secure it undefiled and in ample volume thoroughly to bind together the other metals. But when once obtained, many of his difficulties are over, for it is not difficult to transmute. Mercury is notable among the metals in that at ordinary temperatures it is a fluid the particles of which are set in rapid movement by the least outside influence. 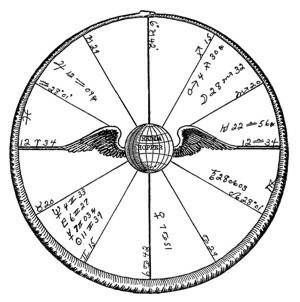 The fleetness of its drops as well as the swiftness of the planet, is well symbolized by the wings on the feet of this ancient messenger of the gods. A little quicksilver spilled in the laboratory and its drops are everywhere, elusive, quick moving, and of brilliant silver-white luster. Mercury is the planet of the mind, and mercury is a metal of wonderful penetration. Its particles readily find egress through substances that are impervious to other metals. It may be strained through buckskin, or even through a chamois-skin bag, and the minutely divided particles will again immediately unite; even as man’s thoughts penetrate the inmost recesses of nature and after their separate work of exploration collect again to become a conviction. The perceptions of man are many diverse beads of quicksilver which when brought together unite in a single shining concept. It is the most unstable of our metals, and volatizes at a very low heat into white vaporous fumes. Similarly are man’s thoughts quickly accelerated by the fires of enthusiasm, to soar aloft into more tenuous realms, leaving the dull cares of earth behind. Thus also, under the heat of impassioned idealism, do they rise to the altitude of eloquence. Mercury is a volatile, changeable, fickle, persuasive metal. Being liquid, it conforms to every surface upon which it rests, and readily adapts itself to every circumstance of life. Nor does it stop with mere conformity to contour, but has the peculiar property of forming amalgams with other metals. So blended it takes upon itself the properties and qualities of whatsoever metal with which united. So also is the mind of man colored and influenced by its contact with the external world. Its trend at any given moment is governed by its transitional contacts, which operate upon it through the well-known laws of association. Mercury has a wonderful power to reflect light; and for this reason is used as a coating for mirrors. The mind, likewise, has the power of reflecting, mirroring on its surface the image of all it perceives in its contact with the world. When heated, our metal is converted into a white gas which has a number of uses in common chemistry; almost as many as have thoughts inspired by zealous enthusiasm in the chemistry of the cosmos. But these fumes when breathed produce in the human organism a peculiar blackening of the gums, called salivation; accompanied by the falling out of the teeth. The teeth and bony structure of the body come under the dominion of lead. They correspond to that which is practical. The mind, or mercury dominated by religious enthusiasm, or by mystical zeal, sometimes becomes feverish and the thoughts volatilize into imaginative vaporings. These mental fumes attack the social structure and result in loss of practicality. Man should not forget that so long as there is a physical body to nourish he has need of teeth with which to masticate physical food. To inhale the fickle fumes of imagination in too great quantity is to get too far from earth; is to become an invalid and a burden to society through speculative salivation. That is, when he loses sight of the practical, be becomes a romantic visionary, lacking teeth with which to attack the essential problems of everyday life. The reflective powers of mercury are utilized in medicine to eliminate the impurities from body, just as they are used mentally to purify the mind. I refer to the purgative, calomel, which is a compound of mercury and chlorine. Chlorine is an acid which readily attacks all metals. Mercury in combination with chlorine partakes of its nature and attacks and eliminates from the system whatever it directly contacts. Calomel is the purgative most prevalently used by physicians of the old allopathic school of medicine, and is the method almost exclusively employed by the old school scientists. On the mental plane it is the power of destructive criticism. More progressive investigators have arrived at the conclusion that in many cases it does more harm than good, injecting a deadlier poison than the one it removes. This is true in science as well as in medicine; for the criticisms often do not discriminate between the refuse that should be removed from the physical and mental constitution and those valuable tissues upon which life itself depends. The spiritual alchemist utilizes both the penetrative, or perceptive, qualities of mercury, and the reflective attributes. 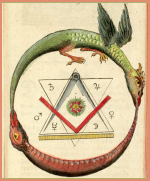 He learns the nature, purity, and value of other metals by associating them with mercury. Amalgams with other metals are not impurities. But all perishable elements, those not grounded in the very truth of things, are impurities. Mercury may readily be dissolved into the first matter in the reverberatory furnace; but it first must be freed from impurities. Silver is a bright, white metal that, although readily attacked by certain acids, does not tarnish under ordinary conditions. It is one of the so-called precious metals, and as such is used for currency among civilized nations. In the human body it is represented by the nutritive functions. Both in society and in the life of the individual, gold supplies the vitality and silver furnishes the food for subsistence. Nations rely upon gold as the bulwark of their financial structure; but silver is the medium of exchange with which homes are supplied with food, and which keeps the wheels of industry turning. This metal is ruled by the Moon. In spiritual alchemy it is the domestic impulses and the experiences with parenthood. These experiences when properly purified need but little heat from the reverberatory furnace to reduce them to the spiritual first matter. They then become, indeed, the nutrition of the soul. Children, to be sure, require watchful care: but responsibilities have a way of developing the ability successfully to bear them. But the chief value of alchemical silver is in the awakening of tender affections that are untinged with self-interest. Parental love is one of the most potent agencies known for displacing selfishness with devotion to the welfare of another. It thus gives a foretaste of the blessed afterlife commonly spoken of as heaven. As silver is very negative, that is, plastic and yielding, too much of it impairs initiative and hinders transmutation. Yet is unusually durable, as witness its use in coinage; for it corresponds to imperishable factors that persist even into the life to come. Parenthood and the home are not merely institutions of earth, but correspond to spiritual verities. Domestic life is something more than just a social expedient. It is the material shadow of conditions on the spiritual plane that hold the most glorious possibilities. In addition to being receptive and a good conductor of heat and electricity, silver has a markedly pleasing resonance. This resonance is exemplified in the lives of those who expand parental love to embrace some larger section of the human race. These beneficent individuals respond to and vibrate in unison with pulsations emanating from the spiritual plane. This kind of silver readily enters into the composition of transmuted gold. Gold is a bright glittering metal of imperishable nature. It is unattacked by any single acid and is unaffected in its quality by fire. These unusual qualities are its mark of distinction, and we search for them throughout the material realm and in the character of man to find that which is capable of being converted into gold. We may be sure that whatever partakes of these qualities, and only such things, therefore, as are immortal and imperishable, may become a permanent part of the body of spiritual man, and thus be transmuted into gold. Gold is ruled by the Sun, and thus represents also the vital principle of all life. It is the central, governing authority, the foundation of the financial structure of society, and the source of power both in physical and in spiritual man. The natural gold in the human constitution is the ego, imperishable and as pure as pristine sunlight. But there is another gold that is not the ego, yet that partakes of its enduring nature. This is not the material gold that some strive to make in the chemical shops of the earth. It is a spiritual gold, that is, a gold like unto the ego in its spirituality and continuance. It is even possible to convert, through proper purification, combination and heating, every event of life into this most precious metal. It is possible to use every experience as spiritual metal that enters into the building up of a spiritual form. This immortal body is the transmuted spiritual gold. June 2, 1890, 2:00 a.m. 78:24W. 40:26N. Data furnished by Doris Chase Doane. 1913, May 8, married actor DeWolf Hopper: Mercury trine Jupiter r, Venus sextile Pluto r, Moon sextile Venus p.
Stage actress, then for years a movie actress. Later became a newspaper columnist relative to people of the screen. Also gave such news and comments over the radio. 1949, her column on Hollywood personalities was syndicated and published in newspapers throughout the nation: Sun trine Moon r (publicity), Sun semisextile Saturn r (work). August 3, 1900, 5:00 p.m. 87.27W. 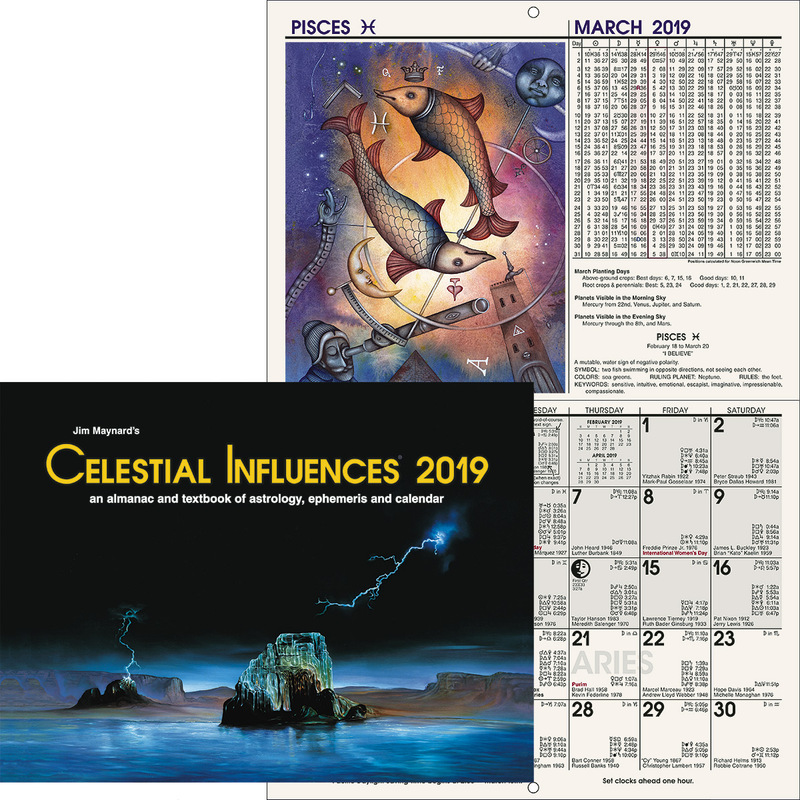 39:45 N.
1918, enrolled Naval Reserve: Mercury semisquare Mars r.
1923, became newspaper reporter: Mercury sextile Pluto r.
1928, wrote his first aviation column: Mercury sextile Mars r.
1934, much success, became roving reporter: Sun sextile Moon r.
1940, reported bombing of London: Mercury conjunction Sun p.
1942, reported fire bombing of London: Mercury sextile Mars p.
1943, published first book: Sun sextile Mars p.
1944, received Pulitzer Prize: Sun sextile Mars p.
1945, April 18, fatally wounded by Jap gunner: Mercury square Neptune r, Mercury square Saturn p, Mars sesquisquare Uranus p, Sun semisquare Venus p.